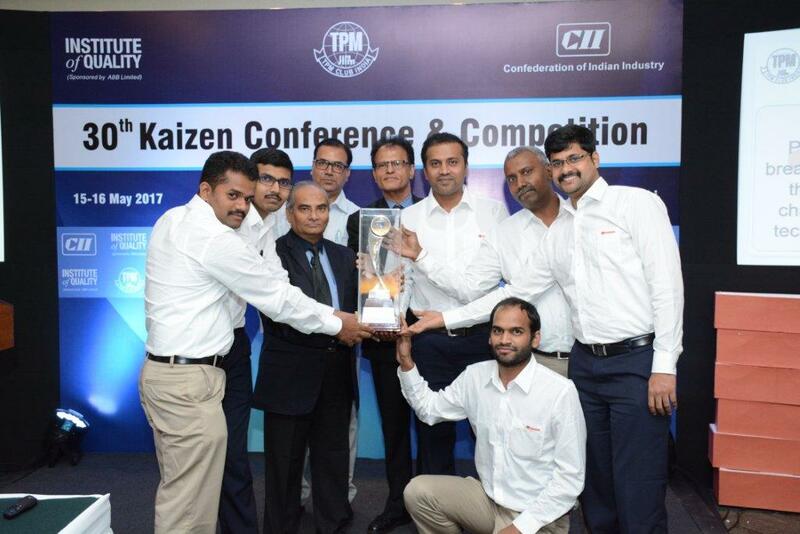 Toyota Kirloskar Motor (TKM) was honored with “Best Kaizen Award” by Confederation of Indian Industry (CII) at the 30th Kaizen Conference and Competition held at the India Habitat Centre, New Delhi on May 16, 2017. Toyota was awarded under the “Breakthrough” category, for initiating innovative practices to reduce energy consumption at the paint booth in the company’s world-class manufacturing facility at Bidadi in the state of Karnataka. The award winning technique involved the use of a psychrometric controller method, ideated and executed internally, to regulate temperature and humidity which eventually led to reduced energy consumption. Total Productive Maintenance (TPM) system at TKM ensures overall synchronization of machines / equipments, processes and employees through smooth integrity of Production and Quality systems that add business values to an organization. Our Toyota philosophy focuses on the relentless problem solving involving people & developing the Kaizen Culture. On receiving the award, Raju B Ketkale, Senior Vice President - Toyota Kirloskar Motor said “We are honored to receive the award as an acknowledgment to our dedication for continuous improvement in efficiency and production quality. The commitment to go above and beyond building just word-class cars and following a more sustainable production process with minimal environmental impact is deep rooted in the Toyota culture.